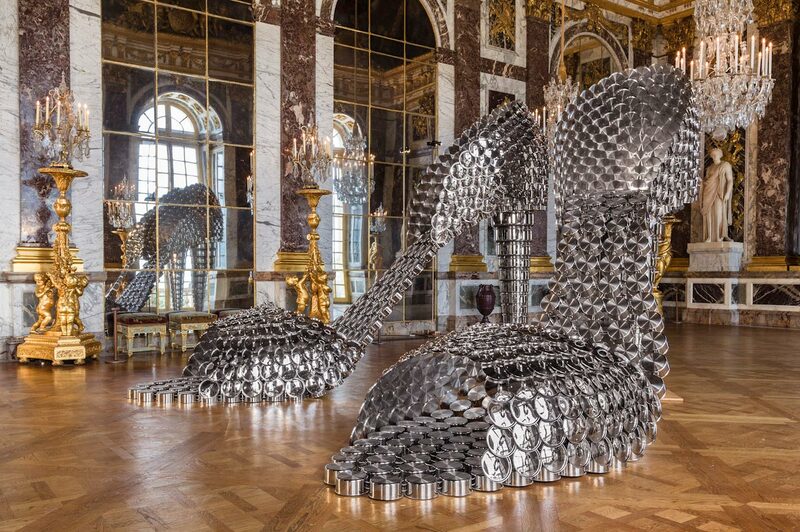 The Excess of Versailles. Concepita come un palcoscenico, teatro di vicende storiche e ora celebrazione dell'eccesso Moderno. 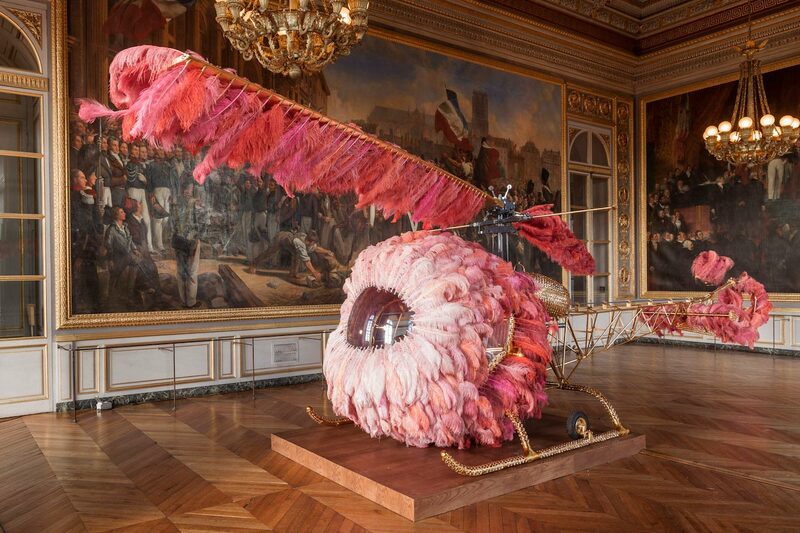 Joana Vasconcelos genera le proprie opere, elaborando quei concetti legati ad un eccesso visivo, reinventando l'essenza di Versailles, universo immutabile agli effetti del tempo dove l'ambiente ricco, abbondante, opulento è sospeso nel tempo. 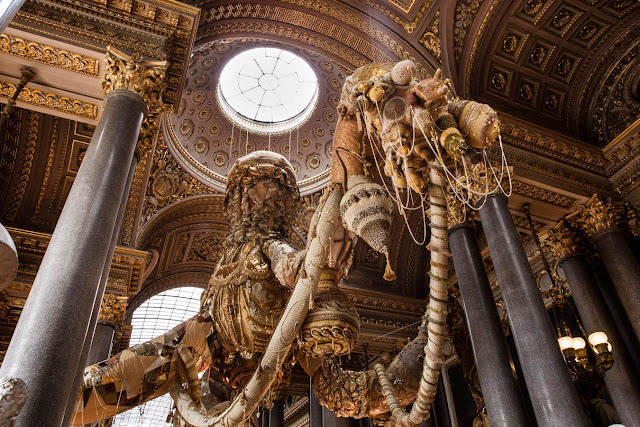 Le composizioni sono ideate come enormi scenografie teatrali, le quali vanno ad immergersi ed ad omologarsi in modo perfettamente naturale nell'ambiente settecentesco, trasportando quel mondo così effimero in una visione speculare tra arte contemporanea e visione antica, due percezioni cosi simili e attuali messe a confronto, generando un esposizione dal sapore Surrealista-Pop mischiato allo stile Rococò, quasi a celebrare un percezione moderna di quella che poteva essere la figura di Marie Antoinette al giorno d'oggi. 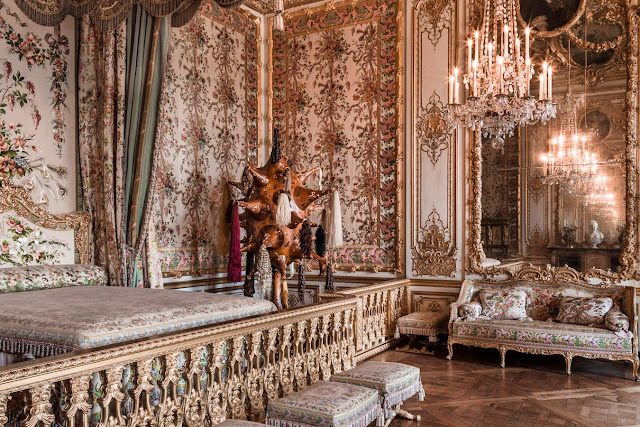 The Excess of Versailles. Conceived as a stage, theater of historical events and now modern celebration of excess. Joana Vasconcelos generates its own works, developing the concepts related to an excess of vision, reinventing the essence of Versailles, unchanging universe to the effects of time where the rich environment, rich, opulent is suspended in time. 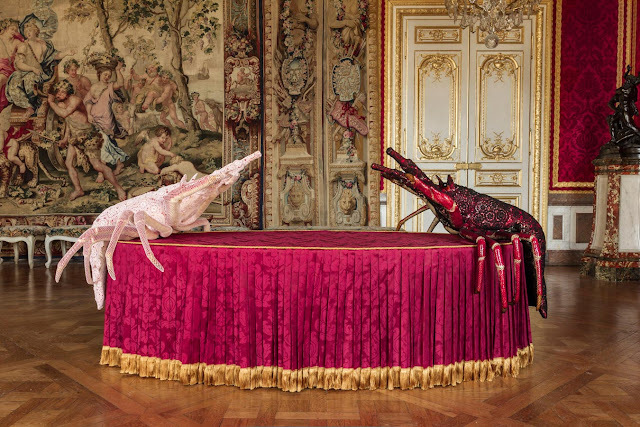 The compositions are designed as a huge stage sets, which go to dive and to homologate so perfectly natural in the eighteenth century, carrying that world so ephemeral in a vision mirror between contemporary art and ancient view, two perceptions so similar and current made comparison, generating an exposure flavor mixed with Pop-Surrealist style, Rococo, as if to celebrate a modern perception of what could be the figure of Marie Antoinette today. Of course now follow your Blog. Sure, just follow your blog. It's an international give away, everyone can join! Thanks, I also enjoy following your Blog, i love it. wooo cool post !! thanks for sharing, btw mind tomfollowing each other? Thanks, yes I'd love to follow your Blog. Ciao Amanda, grazie per la visita. oh wow its so beautiful! Thank you. Surely I will follow your Blog. Thank you very much, is a beautiful compliment. Io studio architettura ed ho sempre pensato che assieme alla moda siano due forme d'arte che vanno perfettamente a braccetto. La penso come te, Architettura e Moda possono tranquillamente procedere sulla stessa strada. Thank you. Already I follow your Blog. You have a fantastic blog! All these pieces are incredible, I love the gaudy feel. Thanks a lot, is one of the best compliments I ever received. Wow... Talk about Visual overload. Amazing. Wow those are stunning pictures! Everything is so artistic and creative. I really enjoyed indulging in your blog. I am now following you on here and Bloglovin'. Thanks a lot, I'm very pleased. Thank you, I'm glad that you went to my Blog. super cool photos, following back!!!! Wow!!! Amazing photos!!! Love your blog, Amanda! Thanks a lot. I was very pleased of your visit. Love the giants shoes !